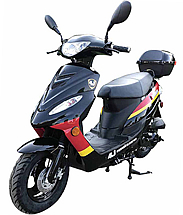 99% Assembled 50cc Street Bike Manual 4 Speed with 12" Tires, Inverted (Upside Down) Forks, Dual Disc Brakes, 12" Tires (MC-163-50), free shipping to your door, free helmet. 1 Year bumper to bumper warranty. The all new 2018 ROKETA MC-163-50 street bike comes with Inverted (Upside down) forks, 12" wheels, Dual disc brake, Heavy duty rear spring shock absorber, Sporty and popular body design. Accelerates to 40 MPH very fast! 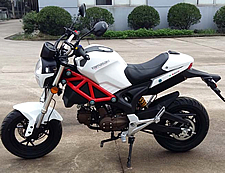 Some States do not require a motorcycle license, registration or insurance for Mopeds /scooters under 50cc. A regular driver's license is sufficient in most states! Please check with your local DMV for detail. 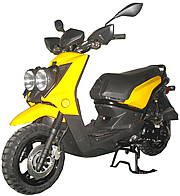 This gas scooter is EPA and DOT approved and is registerable as a street legal vehicle in 49 states excluding California. $99.00 a year; $150.00 for 2 years; $199.00 for 3 years. The manufacturer's warranty starts the day when your scooter is delivered. The extended warranty effective as soon as the manufacturer's warranty expires. 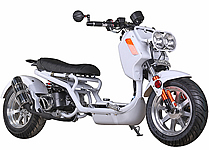 The manufacturer's warranty covers 12 months parts, if you were to purchase a 3 year extended warranty at only $199, your scooter's motor and other warranty parts will be covered under warranty for a total of 4 years. A 50cc motor costs $500 plus shipping, if anything happens during the first 4 years, we will ship you brand new motors free of charge, same way with other warranty parts. Mirrors, footpegs, battery set up and minor adjustments are required. Be sure to tighten all screws, check for appropriate levels of engine fluid and fully charge battery prior to operation. Warranty is valid straight from the box. 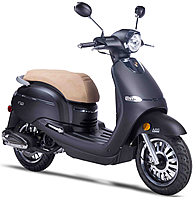 High quality Hydraulic Dual Disc Brakes provide the best possible stopping power for any scooter. 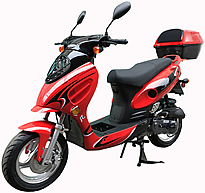 49.5cc 4 Stroke engine which is much quieter, cleaner, and will last a lot longer than 2-stroke engines. Assembly: This Item comes 99% assembled (mirrors, battery set up and minor adjustments are required). Be sure to tighten all screws and check for appropriate levels of engine fluid prior to operation.